ASHLAND, Kentucky – December 29, 2015 - TX Holdings, Inc. (OTC Markets OTCQB: TXHG), a supplier of mining and rail products to the U.S. coal mining industry, today announced financial results for the full fiscal year ended September 30, 2015. 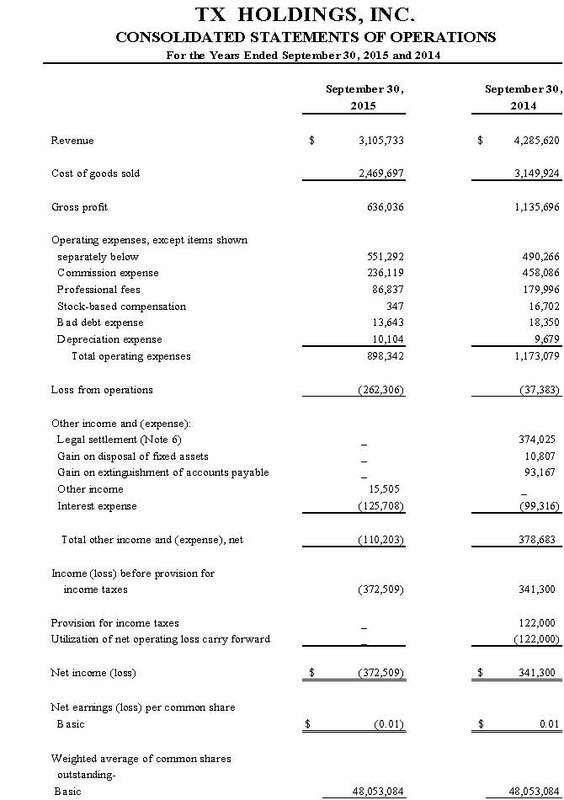 During the year, revenues decreased due to overall lower sales demand and the company incurred a $372,509 net loss. 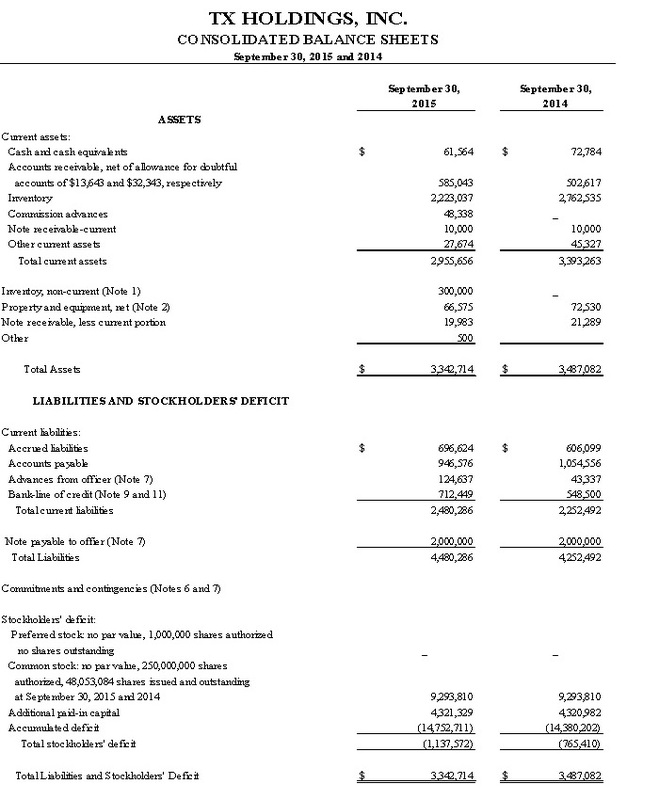 Gross profit was $626,036 compared with $1,135,696 in the fiscal 2014. Revenue for the 2015 fiscal yearwas $3,105,733, a decrease of $1,179,887 or 27.5% when compared to 2014. Cost of goods sold for the year was $2,469,697 compared to $3,149,924 in 2014, a decrease of 21.6%. Gross profit for the year 2015 was $636,036, a decrease of 44% when compared to 2014. Net loss for 2015 was $372,509 compared to net income in 2014 of $341,300. 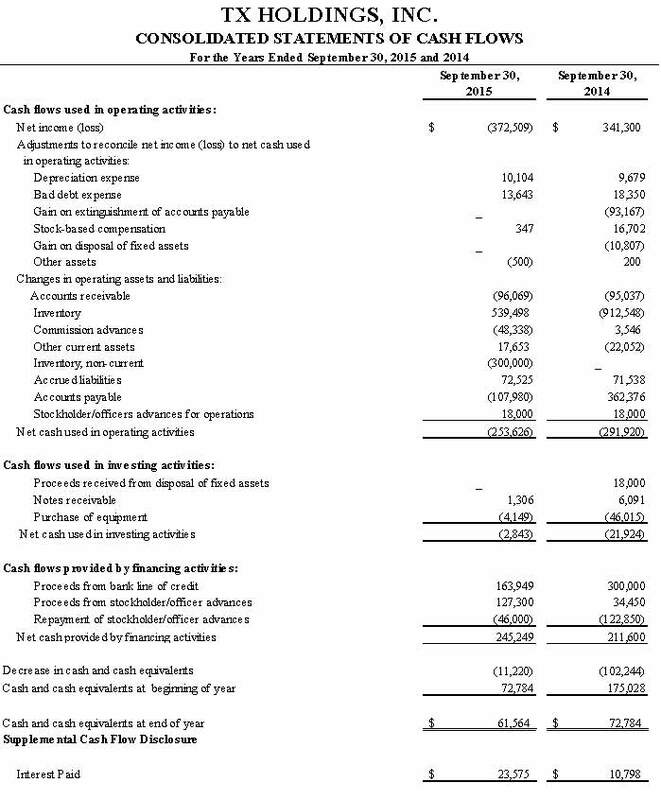 Loss per diluted share was $(0.01) compared to earnings per share of $0.01 for 2014. Operating expenses for 2015 decreased 23.4% as compared to 2014. Other expenses for 2015 were $110,203 compared to other income of $378,683 in 2014. Net cash used in operating activities for the year ended September 30, 2015 was $253,626 as compared to net cash used in operating activities of $291,920 during the same period in 2014. The cash used decrease was a direct result of the company’s initiative to reduce inventory to meet anticipated lower sales demand. Cash flows provided by financing activities increased by $33,649 due to further drawdown under the company’s line of credit of $163,949 and net cash advance from Mr. Shrewsbury of $81,300. At September 30, 2015, the company had cash and cash equivalents of $61,564, a decrease of $11,220 when compared to September 30, 2014. Inventories (current and non-current) and accounts payable decreased 8.7% and 10.2% respectively, compared to year end 2014 as a result of lower sales demand. Accounts receivable were $585,043 as of September 30, 2015, as compared to $502,617 as of September 30, 2014, an increase of 16.4%. To fund ongoing operations, the company continued to rely upon financing provided by its CEO, including a note and noninterest bearing advances aggregating approximately $2.12 million and a secured bank line of credit, of which $712,449 had been drawn upon at fiscal year-end 2015 that is guaranteed by our CEO. On December 3, 2015, we obtained a new term loan from our bank of $711,376, the proceeds of which were utilized to repay our line of credit. The loan is for a term of five years and currently bears interest at the rate of 3.25% per annum. We agreed to make equal monthly repayments of principal and interest under the loan of $6,967, commencing January 3, 2016. The loan is secured by a priority security interest in our inventory and accounts receivable, is guaranteed by our CEO, Mr. Shrewsbury, and our indebtedness to Mr. Shrewsbury is subordinated to the bank loan. Except for the historical information and discussions contained herein, statements contained in this release may constitute forward-looking statements within the meaning of the Private Securities Litigation Reform Act of 1995 (PSLRA) and other applicable law. When used, the words "believe", "anticipate", "estimate", "project", "should", "expect", “plan”, “assume” and similar expressions that do not relate solely to historical matters identify forward-looking statements. Forward-looking statements are based on the company’s current assumptions regarding future business and financial performance. Forward-looking statements concerning future plans or results are necessarily only estimates and actual results could differ materially from expectations. These statements involve a number of risks, uncertainties and other factors that could cause actual results to differ materially, including the following: our ability to implement our business strategy; our financial strategy; a downturn in economic environment, including in the U.S. coal industry; changes in regulations affecting the U.S. coal mining industry and U.S. coal-fired power plants; our failure to meet growth and productivity objectives; a failure of our innovation initiatives; risks from investing in growth opportunities; fluctuations in financial results and purchases; the impact of local legal, economic, political and health conditions; adverse effects from environmental matters and tax matters; ineffective internal controls; our use of accounting estimates; our ability to attract and retain key personnel and our reliance on critical skills; impact of relationships with critical suppliers; currency fluctuations and customer financing risks; the impact of changes in market liquidity conditions and customer credit risk on receivables; our reliance on third party distribution channels; Securities and Exchange Commission regulations related to trading in “penny stocks;” the continued availability of certain financing provided by our CEO; and other risks, uncertainties and factors discussed in our Quarterly Reports on Forms10-Q, our Annual Report on Form 10-K and in our other filings with the SEC or in materials incorporated therein by reference. Any forward-looking statement in this release speaks only as of the date on which it is made. We assume no obligation to update or revise any forward-looking statement. Notwithstanding the above, Section 27A of the Securities Act of 1933, as amended, and Section 21E of the Securities Exchange Act of 1933, as amended, expressly state that the safe harbor for forward looking statements does not apply to companies that issue penny stocks. Because we may from time to time be considered to be an issuer of penny stock, the safe harbor for forward looking statements under the PSLRA may not be apply to us at certain times.